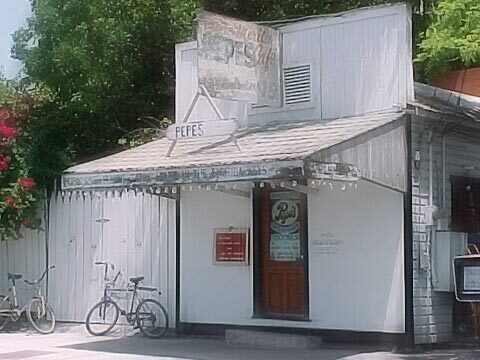 Pepe's Cafe, established in 1909 is the oldest restaurant in town. We are open every day from 7:30 a.m. - 10:30 p.m. At breakfast time we serve everything from traditional breakfast and build your own omelets, to pancakes to creamed chipped beef. We use real butter, jumbo eggs, and Hormel bacon. We make homemade home fries and have great grits. We have homemade granola and lots of fresh fruit to choose from. Our homemade sweet breads are a treat, and you might want to accompany your meal with a fresh squeezed orange juice or a cup of Chock Ful O' Nuts coffee or a screwdriver made with fresh squeezed orange juice. At lunch time we have everything from grilled cheese sandwiches to burgers to fish sandwiches (grilled or blackened). The steak sandwich is popular... chunks of our NY Strip grilled with mushrooms, onions, and peppers and American cheese on a hoagie roll. We have Black Bean Soup and Homemade chili everyday as well as another soup that is made daily. Dinner... well, we are a steakhouse. We cut our own NY Strips and filets to order. People love our 'Dinner For Two'... a 15 oz NY Strip with 2 7/8" thick center cut pork chops, smothered with mushrooms, onions, and peppers and served with a potato and fresh vegetable. Every night we serve our fish at least 4 ways and we have several other meals to choose from, including specials daily. Charlie, Richard and Shelley all work at Pepe's and together they make our desserts, our Key Lime Pie is nice and tart, on a graham crust and served with whipped cream. Other favorites are the Coconut Cream Pie and Apple Crisp served warm with ice cream. (want to see the Recipes?) We are open every day and have been since 1984. Breakfast starts at 7:30 a.m., Lunch at 12, and Dinner from 5:30 to 10:30 every night. If you are looking for a relaxed laid back restaurant and bar, this is the place for you. You will see the same faces, year after year, and there is a really good reason for that.